Mt. Nyainquentanglha (Nyenchen Tanglha) is very beautiful mountain and it is a 700-kilometer (430mile) long mountain range located in the Tibet autonomous region of the People's Republic of China. It has an average latitude of 30°30'N and a longitude between 90°E and 97°E. Together with the Gangdise (Gangtise) range located further west, it forms the Transhimalaya (or Gangdise-Nyenchen Tanglha) range, which runs parallel to the main Himalayan range north of the Yarlung Tsangpo river. The range is divided into two main parts; the West and East Nyenchen Tanglha, with a division at the 5,432m. high Tro La pass near Lhari. West Nyenchen Tanglha includes the four highest peaks in the range, all above 7000m. Mount Nyenchen Tanglha (Nyainqêntanglha 7,162m. ), Nyenchen Tanglha II (7,117m. 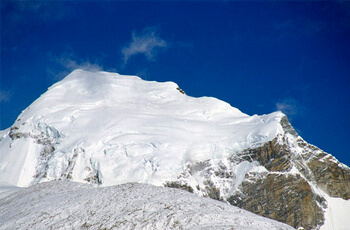 ), Nyenchen Tanglha III (7,046m.) and Jomo Gangtse (Qungmoganze) (7,048m. ), all located in Damxung (Damshung) County of Lhasa Prefecture. West Nyenchen Tanglha separates the basins of the Yarlung Tsangpo River (Brahmaputra) in the south from the endorheic basins of the Changtang in the north. In particular, it lies to the southeast of Namtso Lake. Similarly east Nyenchen Tanglha, located in the prefecture of Nagchu, Chamdo and Nyingchi, marks the water divide between the Yarlung Tsangpo to the south and the Nak Chu river (which becomes the Nujiang and Salween in its lower reach) to the north. Most of the peaks in East Nyenchen Tanglha, sometimes called the Alps of Tibet, are unclimbed. Day 02: Free day in Kathmandu for official briefing. Day 04: Fly to Lhasa at Gongar meet our staff and transfer to Hotel. Day 05: Sightseeing in Lhasa, Drepung, Sera and Norbu Lingka monasteries. Day 06: Sightseeing in Lhasa, Potala Palace, Jokhang and Barkhor market. Day 07: Drive to Nyainquentanglha Base Camp (350Km.). Day 08/10: Stay at base camp for acclimatization. Day 11-29: Climbing Period for Nyainquentanglha 7162m. Day 31: Drive back to Lhasa. Overnight in Hotel. Day 32: Free day in Lhasa and overnight at Hotel. Day 33: Gonger airport, Fly back to Kathmandu then transfer to Hotel. Day 35: Last minute, transfer to airport for onward journey. Expedition Permit fee of Mt. Nyainquentanglha. Air ticket: Kathmandu – Lhasa – Kathmandu - Lhasa (Gongar airport round trip). Air ticket: Kathmandu – Lhasa - Kathmandu (Gongar airport round trip). Kitchen tent, dining tent, store tent, shower tent, toilet tents, chair, table at BC and ABC.